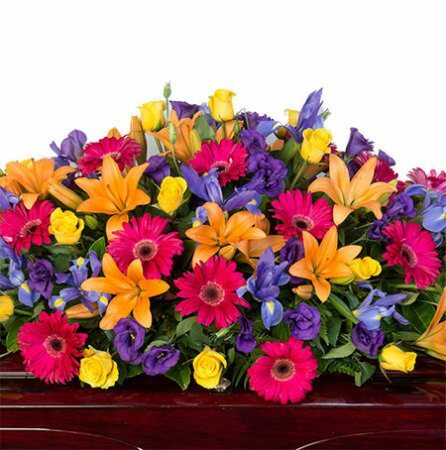 A colourful funeral casket flower combination of bright blooms in tones of orange, purple, pink and yellow, including Asiatic lilies, roses, gerbera daisies and iris. 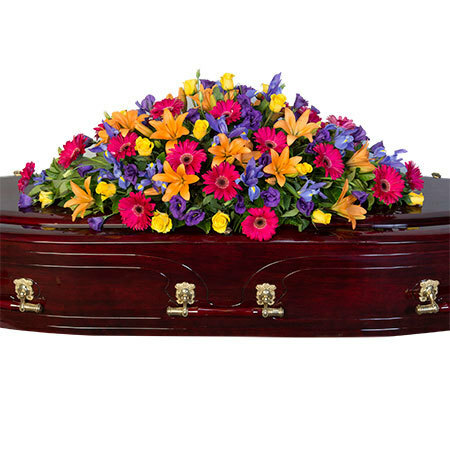 Offset with lush greenery, this traditional funeral casket arrangement can be conveniently arranged online or by phoning our friendly consultants on 1800 66 66 46 or emailing sales@flowersforeveryone.com.au. Do you need to organise a casket spray outside Sydney? It`s easy with Flowers for Everyone. Our florists will simply coordinate your order via an affiliate florist network to recreate our design and colours as closely as possible.